The internet brings us all together, especially in the lonely hours of the night. The fact that we can talk to anyone at all still seems like magic to some people. But finding a right place on the internet for chatting the night away sometimes might seem hard. If you’re on the market for love and you love chatting about absolutely everything in the world, one particular online dating site might be just the thing for you. Canadian Chat City is one of the top online dating services in the country of maple syrup, but it definitely did not get there by accident. Canadian Chat City knows what’s truly important – functionality. The sign-up process stakes only 3 minutes of your time, and you can start you search for that special someone with whom you can chat the night away right away. 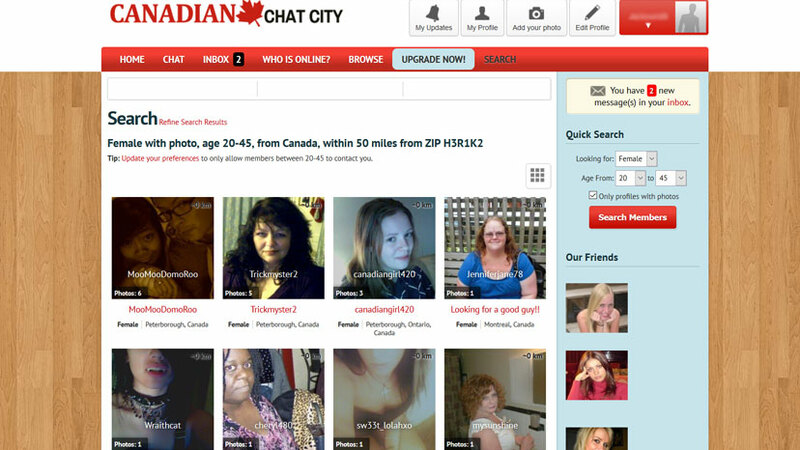 Canadian Chat City is The Right Place to Meet New People – Try it Now! Besides this incredibly easy approach, Canadian Chat City also has several useful features to offer you, as well as a guarantee to a lag-less online dating experience. If you’re truly ready to find the perfect chatty partner for yourself, this online dating service will definitely help you out in your search. Canadian Chat City is a dating site that truly has it all. The effortless yet functional approach to online dating spreads across every segment of this dating service. The simple design might not be according to everyone’s taste, but it definitely works for this site. The background is a combination of a wooden floor pattern and the color white, while the highlights are in a bright red shade. The useful features are located at the top of the site, and they’re incredibly easy to use. Everything is easily-comprehendible and straightforward, and that’s what makes Canadian Chat City one of the top dating sites in Canada. Chatting as a means of finding love has never been as easy as it is now, thanks to this free dating site’s features. As a member of Canadian Chat City, you can browse through the whole member-base if you want to, or you can limit your search in certain ways to make it more specific. There’s also the option of searching for members based on geographical proximity, and the option of choosing certain categories which will make the search as detailed as you want if you upgrade your account to a VIP membership. When you find someone that possesses all of the qualities you’re looking for, you can start the conversation with the person of your choice via the site’s instant messaging service or the chat box. Let the flirty chatting commence! Unlike many other online dating services, Canadian Chat City doesn’t have any fake profiles, bots, or scammers in its member base. Every single member is a real individual, searching for that special someone. Everyone has a different story to tell, and a different lesson to teach you, but they all have one thing in common – the love for chatting. Overall, Canadian Chat City is a truly functional, high-quality online dating site that is proud to be the thing that brought hundreds of chatty couples together. It’s easy to use, it doesn’t have any aspects that can cause confusion or fuss, and it delivers the ultimate online dating experience to all of its clients. Clean, simple, and highly-functional, it seems that this dating site has it all and is not afraid to share.